Photo: Louis Smith Tainter House, ca. 1889, Menomonie, Wisconsin, designed by architect Harvey Ellis [1852-1904]. 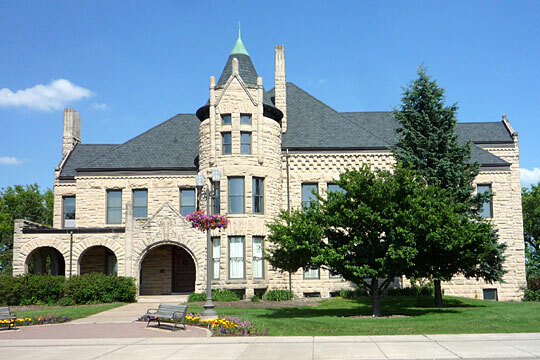 Originally built as a private home, it now serves the University of Wisconsin-Stout as the Stout University Foundation and the Stout Alumni Association. Listed on the National Register of Historic Places in 1974. Photographed by User:Bobak Ha'Eri (own work), 2009, [cc-by-3.0 (http://creativecommons.org/licenses/by/3.0)], via Wikimedia Commons, accessed November, 2012. On May 29, 1848, Wisconsin became the 30th state in the Union, but the state's written history dates back more than 300 years to the time when the French first encountered the diverse Native Americans who lived here. In 1634, the French explorer Jean Nicolet landed at Green Bay, reportedly becoming the first European to visit Wisconsin. The French ceded the area to Great Britain in 1763, and it became part of the United States in 1783. First organized under the Northwest Ordinance, the area was part of various territories until creation of the Wisconsin Territory in 1836. Since statehood, Wisconsin has been a wheat farming area, a lumbering frontier, and a preeminent dairy state. Tourism has grown in importance, and industry has concentrated in the eastern and southeastern part of the state.